In June 1964, the Nation of Islam sued to reclaim Malcolm X's residence in Queens, New York, which they claimed to own. The suit was successful, and Malcolm X was ordered to vacate. On February 14, 1965, the night before a scheduled hearing to postpone the eviction date, the house burned to the ground. Malcolm X and his family survived. No one was charged with any crime. On February 14, 1965, unidentified attackers firebombed Malcolm X's New York house while he and his family were asleep inside. 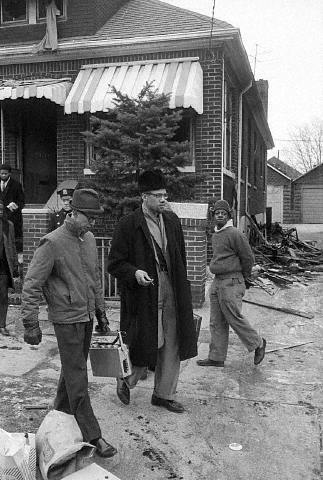 The week before his murder on February 21, 1965, Malcolm X's house had been fire-bombed, with him and his family inside. At first he came out publicly blaming Black Muslims, saying that they were angry over his split with Elijah Muhammad, and the Nation of Islam. 1965, New York City: Malcolm X's home is firebombed but no injuries are reported. After 15 years of involvement with the Nation of Islam X's approach to Black Nationalism varied from those of Elijah Muhammad to such an extent he announced the formation of his own Harlem-based organization. Malcolm X received a number of death threats as he became openly critical of the Nation of Islam and Elijah Muhammad's behavior in particular. Eleven days after the firebombing, in front of a crowd of hundreds including his pregnant wife and three of their children, he was assassinated by three men with ties to the Nation of Islam.